Giglio Island travel guide: hotels, apartments, campsites, real estate, diving center, beach, sightseeing, photo gallery top things to see on the Island of Giglio. In Giglio Island, amongst other things, you can admire a lot of natural beauties. The unique characteristics of the sea make this island a true gem of the nature: Giglio beaches are famed for Crystal clear water, a so various coast, formed by photogenic cliffs, running right down to the season on the west coast and smooth granite ones on the east side, sandy beaches and several suggestive bays. A particular attention goes to the sea beds of Giglio which are certainly amongst the most fascinating in Italy: you can admire underwater meadows, gently sloping walls of rock, canyons coloured by gorgonie and sea sponges. An alternative way to discover the beauties of the island is to do characteristic walks on Giglio hills and mountains completely surrounded by a very rich and unspoiled nature and breathtaking views. 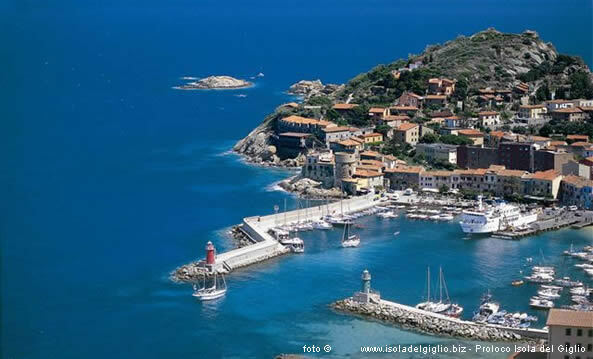 The main villages (which cover only 10% of the isle) are 3: Giglio Castle, Giglio Port and Giglio Campese. The Port is little and picturesque, a very lively part of the isle with its narrow streets, nice little characteristic shops, craftsmen, bar and restaurants with terraces over the sea. The Castle is situated at the top of the isle, at metres 405 above sea level. It's formed by a fortified village, with an access gate and completely surrounded by large-built walls from which you can admire a very beautiful seascape. In the village nothing seems to have changed throughout the centuries: narrow streets, little places, the ancient church give the feeling to go back in time in an unreal atmosphere. Campese is the most modern part of Giglio Island, it's actually a tourist village, located at the back of the large red ground beach. This beach is "defended" by the big rock at the southern end and by the "Medicea" Tower up north. Don't miss the marvellous sunset, you can admire from this beach.